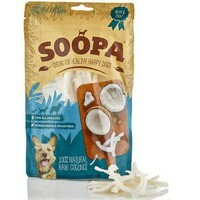 Soopa 100% Natural Raw Coconut Dog Treat's are made of 100% coconut. Simple, natural and tasty. Coconut meat contains medium chained triglycerides, metabolised in a different manner to other triglycerides. This fat is used as a source of energy transported directly to the liver rather than being stored as fat. 50% of the special saturated fat in coconut is Laurin. Research shows that Laurin can be converted in the body to Monolaurin, holding great antibacterial, antiviral and antifungal properties. MCTs in coconut can actually help stimulate your pet’s metabolism aiding management of weight as opposed to the myth that the saturated fats in coconut will be fattening and unhealthful. Coconut is also relatively low in protein and ideal for those on restricted protein diets. If your pet has allergies, scurfy skin or a rash then it’s a fabulous hypoallergenic treat to feed your pet. Suitable for dogs over 8 months of age.